Whenever I stop by someone's blog and they haven't posted for awhile, I always hope that they haven't just stopped blogging altogether. I never mean to be away for quite so long, but one thing leads to another and before I know it, a month (or two) has passed. For Christmas I got a Microsoft Surface Pro so I'm trying to learn to use it. It is lighter weight than my old laptop (and a whole lot faster), and the screen snaps off and becomes a tablet. That makes it easier to take photos and get them into my blog. There is a pen that is held on the side by a magnet, and I know I can do something with that. Right now I know just enough to be dangerous, so hopefully it will all get easier. Here are some of the projects I've finished since I last wrote. 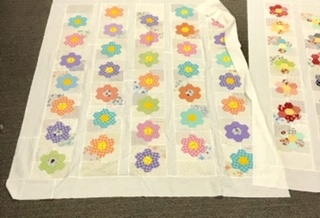 This is two different versions of my 1797 Revisited quilt. 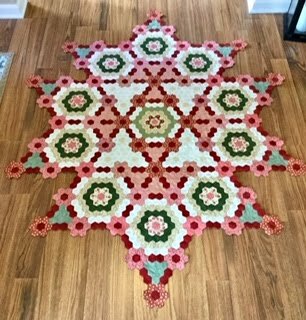 This is a reproduction of an antique quilt, and there is an Instagram group working on this quilt and sharing photos. I bought the smaller paper pieces from Yellow Creek Designs in their booth at the Shipshewana Quilt Festival. They measure 3/8" X 7/8". After I went to the Jane Stickle Quilt Retreat in November and saw others using paper pieces 5/8" X 1 1/2" (also from Yellow Creek Designs), I came home and ordered a package of the larger size. The 3/8" and 5/8" is the distance on the short side of the hexagon. That 1/4" sure makes a big difference in the overall size. I have a lot of pieces prepped for both sizes, but I am really liking that smaller size. I will probably end up doing something with both. This is part of the top of the Rose of Kaleigh quilt. 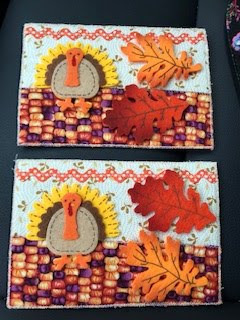 I did this as a sew along on Sue Daley's blog. 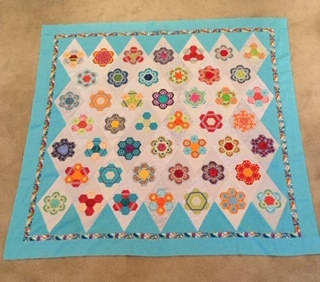 This is a reproduction of an antique quilt, and the original has this part you see in the photo appliqued' to an off white fabric with a swag border around the outside. This was a big project, and it will take awhile longer to finish it. These are all 3/4" hexagons that were English Paper Pieced. This is the Kingfisher Quilt done as a quilt along with bloggers Stitched in Color and Tales of Cloth. They gave us the dimensions for the background diamonds, setting diamonds, and borders. We did our own thing with the hexagons. These are 1" hexagons that are English Paper Pieced. This hexagon quilt was in the June issue of American Patchwork and Quilting. The pattern is by Sherry McConnell of A Quilting Life blog. The photo doesn't show it, but the backgrounds are scrappy, pieced four patches. My friend Michele and I traded each other half of a layer cake so we both would have a lot more scrappy variety in our backgrounds. 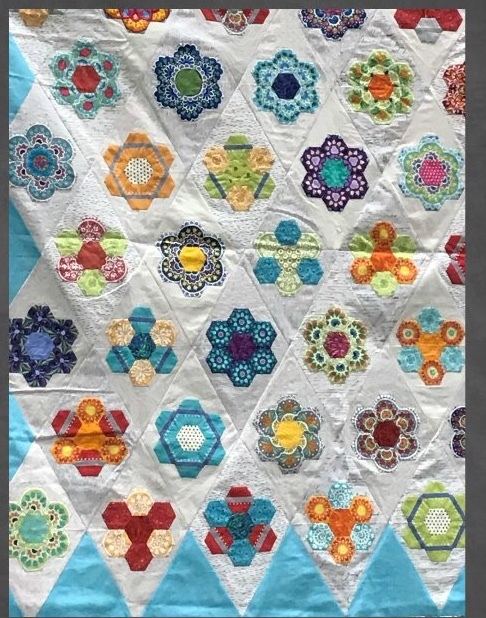 These are also 1" hexagons that are English Paper Pieced. These are all just tops so there is a lot of quilting in my future. There are more projects, but I need daylight to take photos. I've made postcards for Halloween, Thanksgiving, and Christmas. We had a nice Christmas. Our son treated us to Christmas at the Zoo. It was beautiful but really cold. The only snow we've seen here is that made by the artificial snow machine at the zoo. Our Christmas decorations are still up including our outside lights. We have two neighbors that still have their outside lights lit, so we will keep ours going until at least the weekend. We've been playing games and working puzzles and just having fun. Do you still have your Christmas decorations up? 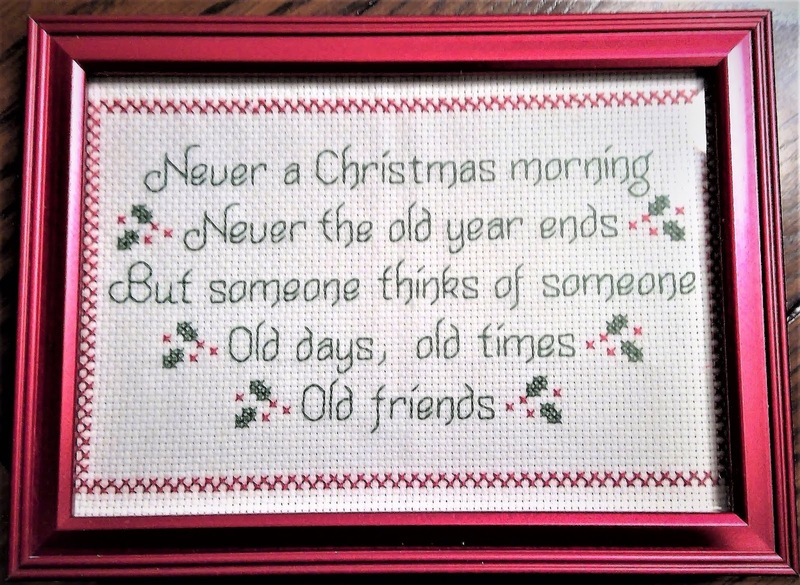 I wish you all the happiest of New Years with good health and lots of stitching ahead. 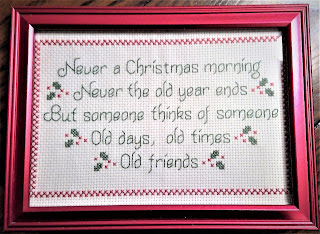 This is a cross stitch that I did years ago.